Asutype integrates into the Windows operating system, runs in the background of all applications and continuously watches your typing. If you make a mistake, it will red underline it along with an alert beep. By giving you real-time feedback as you type both audibly and visually, you have a chance to take immediate action on a mistake if you want to do so. By highlighting the mistake on the document you are working with, you can spot and fix highlighted mistakes easily at any time if you choose to fix the mistakes after you type. You don't need to do anything to have your typing spell checked. Just type continuously as you did before and if you make a mistake, it will be flagged in real-time! Because Asutype works everywhere, you can use it to ensure your typing is checked in any applications which do not support spell check features such as NotePad, WordPad, many e-mail composers, web browsers, instant messenger applications, or in places a traditional spellchecker cannot be used such as in dialog boxes, data entry fields or even in console windows. Asutype fully supports Unicode and can spell check multi-lingual text automatically as you type. You don't need to do anything extra; no switching back and forth between languages is needed. If you have dictionaries of your languages open, you just type normally and Asutype will automatically understand the language you type. If you have your own word list, you can create a new dictionary and import the word list to create your own dictionary easily by a few clicks. You can build up your own dictionary as you go. 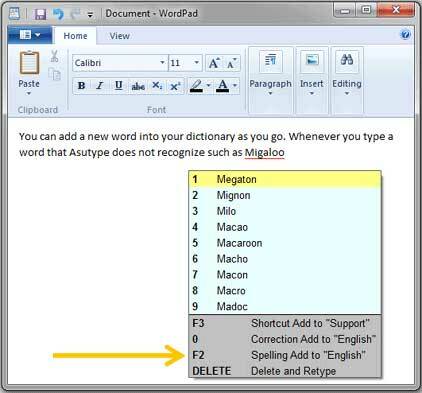 Every time if you type a word that is not in any dictionary, Asutype will show you a suggestion window containing some choices and you can press F2 to add the word into your dictionary on the fly. Because Asutype works at the operating system-level, this new word will automatically recognized in other applications or places as well. Therefore you only have to press F2 key once for every new word! By only pressing F2 key (effortlessly) and adding your own words as you go, normally after a couple of weeks using the software it will learn most of your vocabulary and become much smarter. By working at the system level and catching spelling errors as you type, no error can slip into your writing unnoticed. You can avoid the pain of detecting a mistake too late (think about how many times you discovered a critical or embarrassing typographical error only after you had printed your document out or dispatched it) and enjoy accurate and fast typing.